We are engaged in manufacturing, supplying and exporting a quality-assured range of Disposable Surgical Blades to our clients at nominal prices in the market. Offered products are widely appreciated for their sharpness, resistance against corrosion and durable standards. Further, our professionals manufacture these products using high-grade quality raw material, procured fro authorized vendors of the industry, in tandem with highest quality standards. Offered by us is a comprehensive range of Surgical Blade. 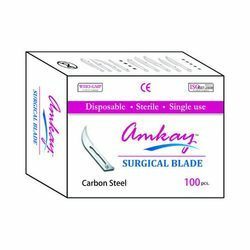 These blades are demanded widely in a number of hospitals and clinics and are appreciated for their longer shelf life, effective functioning and resistance against abrasion. Further, our professionals are capable of making these blades available in varied specifications in order to meet the exact requirements of the clients, at pocket-friendly prices in the market.